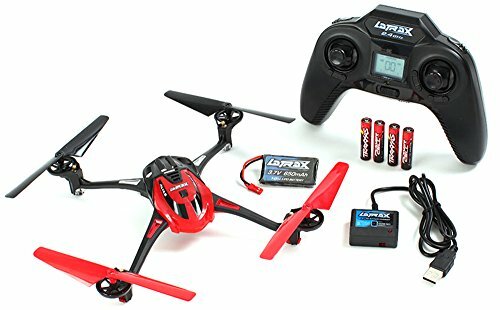 If you are not bothered with the fact Alias has no camera and you just want to fly - then no other model in this price range comes even close to Latrax Alias. Just go for it, you will not regret it! LaTrax has been making high-quality, high-performance, and ready to run RC cars since 1974. LaTrax is backed by Traxxas, a well-known producer of radio controlled boats and cars. Their accomplishments in the RC car industry are known to everyone. This drone is available in three different color choices – orange and black, blue, black and green and red, black and white. The LaTrax Alias is built within a high-tech molded frame. It has a 2.4 GHz radio control system. It is also equipped with a quad-rotor thrust with auto-levelling 6-axis flight system. These features help keep your quad in the air. The Alias has a high-capacity 650mAh Li-Po battery, which can be recharged using a USB cable. Each propeller of this quadcopter has a high-output motor. There are a couple of features that stand out this drone from other competitors, such as crash-proof feature and its affordability. LaTrax claims that this drone can withstand rough flights and that is virtually indestructible. These are the reasons why this drone is ideal for novices. However, expert pilots will also find much to like about this drone. The LaTrax has designed this model to withstand novices’ mistakes and rough flying. This is very important for anyone who has ever bought a costly quadcopter, only to crush it during its first flight. This „experience“ can be extremely frustrating and upsetting. The LaTrax Alias is very flexible and adaptable to crashes, impacts and bumps. You can deliberately fly it into trees or the ground and it will survive. It will dust itself off and fly back into the sky again. This drone is even capable to withstand by being run over by a bike, as it can be seen from the producer’s video. The Latrax Alias is built to last and it is the ideal entry level quad for the novice. It doesn’t matter if you are not experienced flyer, and even if you crash it you can simply continue on. This drone is backed up by a lifetime warranty so you can fly without needing to worry. Once you have mastered flight, you can switch it to expert flying mode and learn how to fly a drone without the autopilot system. Also, don’t worry if any of the small parts on the drone should require replacement because there are optional accessories available for buy. This drone has some unique and amazing features which make it ideal entry-level drone for beginner pilots, but also enough to interest the advanced pilots. The top feature of this drone is definitely the auto-levelling 6-axis flight system. This utilizes proprietary flight control software which allows you to control the LaTrax in the air. There are three different flight modes – easy, fast and expert. Easy mode is perfect for beginners. In this mode you will have full auto-levelling from the limited pitch angles and 6-axis gyro. Fast mode, where most pilots spend their time, still uses some of the features of the auto-levelling. However, this mode allows you to unlock the full speed of the Latrax Alias. Also, one-button stunts and flight angles are now active so you can try more complicated moves. The Alias will roll, twist and flip with the press of the button. The final mode al known as expert mode. In this flight mode you can take full control of the Alias. The auto-levelling software is disabled and all stunts are done completely manually. Only experienced pilots should use this mode. It will allow you to have responsive, linear control of your quad and this feature will please the professionals. Don’t worry if you find yourself in trouble because there is an emergency auto level recovery button in expert mode. One other great feature of the Alias is crash-proof feature and manufacturer claims that this drone is virtually indestructible. The Alias is designed to withstand the dings and bumps, so if you do crash you shouldn’t worry about it. However, you may still need to replace a blade from time to time, but these parts are inexpensive to replace. The controller is light, fits nicely in the hand and it is about the size of most of today’s controllers. This transmitter allows for precision control of your quad so you can fly it for longer periods of time. There are thumb pads on the gimbal for comfortable control. The gimbals provide great precision control that responds instantly to the quad. They are included in package. However, for those who like to control their drone in traditional way, there are sticks that can be bought separately. The sticks are quickly and simple to install. The controller on this drone is simple to use. The radio system is controlled with Traxxas technology and it will never interfere with some other person flying a quad near you. You can check your settings pretty fast because the controller is equipped with an LCD screen. Also, if you want to try customized settings, it will guide through the menus. Special memory technology of the Alias will allow you to stay connected and never lose contact with your drone the minute you turn on the power. Also this technology will allow you to run the same flight plane many times because it is able to remember up to ten flights. The Latrax Alias is made with a plastic composite frame which is very difficult to damage. The composite plastic is very flexible. This is the reason why your drone will bounce back easily when it crashes into the ground. The amazing design and flexible structure are the main reasons why the Alias is perfect for the beginners, but experienced pilots are also prone to crashes and hits from time to time. The Latrax Alias has motors rated at 50% more power than the average for quadcopters of this size. Each propeller has a motor and they each run independently of the others. This gives the quad the thrust it needs for high-speed flight manoeuvres. Also, you can vary the thrust and power of each of the motors in order to have directional control. Another amazing thing about this drone is that it won’t get tangled in grass because the drive system is elevated. The additional canopies, LED lenses and rotor blades can be bought in green, orange, blue and red. Also, the canopies, lenses and rotor blades can be interchanged for a custom color mix. with two charging modes are included. This allows you to charge in normal mode or in fast mode. When your quad power is running low and has to be charged up, the fuel gauge will alert you to it. This will allow you time to return to home before your battery dies out. The Li-Po battery pack will allow you to fly about 15 minutes and it takes around 30 minutes to recharge it for the next flight. If you want to increase flying time you can simply swap out the battery pack for a new one. The amazing stunts can be performed with only the flick of a stick and push of a button. Rolls, flips and twist are some of the stunts you will be able to perform. With other manufacturer’s quads, it can take a very long time to learn how to perform stunts and aerobatics. However, with the Alias you will learn the flawlessly right out of the box. The flips and rolls can be performed right or left, backwards or forwards and even diagonally. Also, you can perform twister, rotating around its central axis with your Alias. These stunts can also be performed in succession. The expert mode gives you full control. However, you can try rolls, flips and twists in this mode. Spare parts are readily available and this allows simple and fast repairs. The boom arms have integrated LED lights which that light up the whole drone. The lights work in both night and day visibility. The lights will automatically get brighter at night because they can sense when it begins to get darker. These lights will not only provide a bit of flash for your Alias, but they also provide orientation. In this way you can see the lights line up with the horizon. The LED lights also allow you to keep a better eye on the drone in the air. There are many amazing add-on accessories to add to your Alias. The main unit is backed up by a lifetime electronics warranty but some minor parts can be damaged during flight and they can be replaced. The LED lenses are available in sets of four and five different color choices: green, orange, red, blue and clear. These light enable you to see your quad at night time and at a distance. are not covered by warranty because they are usually damaged by flight. However, they cost $2 a pair and they are cheap enough to replace. They are available in six different color options: blue, black, white, orange, red and green. The canopies are also cheap and they are about $5 each. They are available in five different color choices: green and black, orange and black, white and black, red and black and blue and black. , for both the Alias and controller, don’t last forever. But the great thing is that the replacement batteries and chargers are available on the website. It is also recommended to buy extra alkaline batteries. The Alias main frame is available and if it is bent out of shape it is recommended to switch it out for a new one. This is very simple and fast process. The lower main frame is also available. These two frames are available in two color options: white and black. that has to be bought separately. The camera attaches to the underside of the quad. The Latrax Alias website offers many flying tips and information to help you get in the air, learn stunts and stay in the air. This is very important because you will need as much help as you can get when you are learning how to fly the Alias range. There are many photographs for you to check out the Alias accessories and different color choices. You can buy several different types of Latrax Alias accessories or drones. However, if you don’t want any of these, you can buy the quad itself. There are many videos that will help you get started on your first flight. There is also a video to help you learn to customize your radio controller settings. Another video that is very helpful to check out is how to learn to perform complicated tricks, such as rolls and flips. You can turn your Alias to expert mode once you’ve progresses past the basics to learn a couple of tricks. This will allow you to perform advanced stunts. You can also download different manuals from the website. They can help you with whatever stage you are in your learning. You will find a manual to help you with motor replacement when you need to do repairs. The LED light kit instructions are very useful if you have to replace the Alias’s LED lights. There are also instructions to help you install the camera. And finally, in case you have lost your box, there is the Latrax Alias box graphics and an Alias parts list. Also, it is very important to register your Alias. This is important because you may need further support than the literature can help you with. There is a troubleshooting guide to help you solve your problems. The website is full of PDFs and guides on how to perform more stunts. And finally, there is an online FAQ where you can find solutions to the more common problems you may encounter. The Latrax Alias is ideal for children to learn how to fly or for those people who are just entering the quadcopter hobby because it seems that it is virtually indestructible. The Alias is an excellent way to learn how to fly a drone. And then move onto more costly and difficult to fly drones. There are also many amazing new features to keep the seasoned quad lovers happy as well. They will all want to use the Alias for professional flight manoeuvres, without the worries that they will wreck it or crash it.